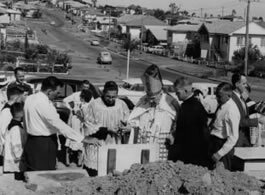 ​​1955: Parish LAND bought under Archbishop James Duhig's authority. 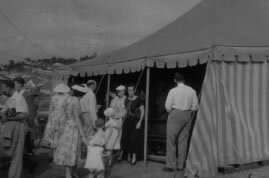 1956: Parish cut off from ENOGGERA. Fr Michael Carew is first Parish Priest. ~ 28th April: FIRST MASSES celebrated in Marquee on the Property. Presided over by Fr Mick Carew. ~ 5th May: FOUNDATION STONE for first Church laid by Archbishop Duhig. ~ 10th November: Church and Presbytery BLESSED and OPENED by Archbishop James Duhig. 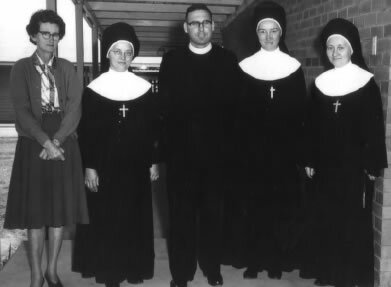 1960's: Parishioners took on the role of Catechists in local State Schools. ~ Fr John Gerry appointed Parish Priest, Sisters of the Holy Family of Nazareth arrive. ~ January: School begins with Sisters on the staff. ~ August: Convent blessed and opened by Archbishop James Duhig. 1963: Second stage of school opened. 1964: Third stage of school opened. ~ The Stafford Parish Credit Union was established in June at the instigation of people like Noel Hutchinson together with Fr. Gerry. The establishment was assisted by the Queensland Credit Union League. (The Queensland Country Credit Union (based in Mt. Isa) took it over around 1995 and transferred it to the Rode shopping centre, where soon after, it closed). ~ OLQOA took part in World Day of Prayer and continues to date. ~ We celebrated with the Sisters of the Holy Family of Nazareth their Century. ~ In January Fr Clem Hodge is welcomed to the Parish. 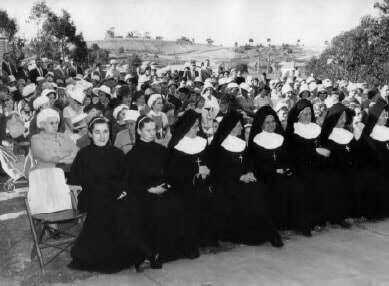 1977: Deacons from Banyo worked part-time in the Parish. ~ We embraced Movement for a Better World and later adopted New Image of Parish, and CONNECT was a result of this movement. 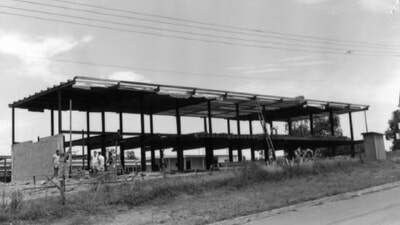 ~ The Brisbane City Council erected traffic lights at the corner of Minimine Street and Appleby Road and the entrance to the Church Carpark. ~ The Silver Jubilee was celebrated with Mass on the school oval. ~ Indoor Bowls Club commenced. ~ 15th March: Foundation stone for new church laid and blessed by Archbishop Francis Rush. ~ 26th June: NEW church blessed and opened by Archbishop Francis Rush. Mid 1990s: Sisters withdraw from the school administration and continue on the staff. ~ Fr Michael farewelled from the Parish. ~ Fr Marian Wierzchowski and Fr Tony Zemula of the Pallotine Fathers arrive. 23rd May 2004: Fr Kevin Carey is appointed Parish Priest by Archbishop John Bathersby. ​2nd January 2010: Fr Denis Scanlan is appointed Administrator by Archbishop John Bathersby.